the receipt and referral of their grant application in eRA Commons. This updated tutorial will familiarize eRA Commons users with the Personal Profile and the importance of keeping it updated. Tutorial to guide referees through the process of submitting reference letters through the eRA Commons to support career development or fellowship award applications. This 7 minute tutorial video will demonstrate how Signing Officials and Principal Investigators, access, initiate and respond to closeout reports and requests for additional information. This tutorial demonstrates how to initiate and submit an electronic request to withdraw an application through eRA Commons. The initiation of a Withdrawal Request can be done by both an SO and a PI. However, only the SO has the ability to submit the request to NIH. The video walks you through the process of initiating a request, routing to the Signing Official, and submitting the request to NIH. 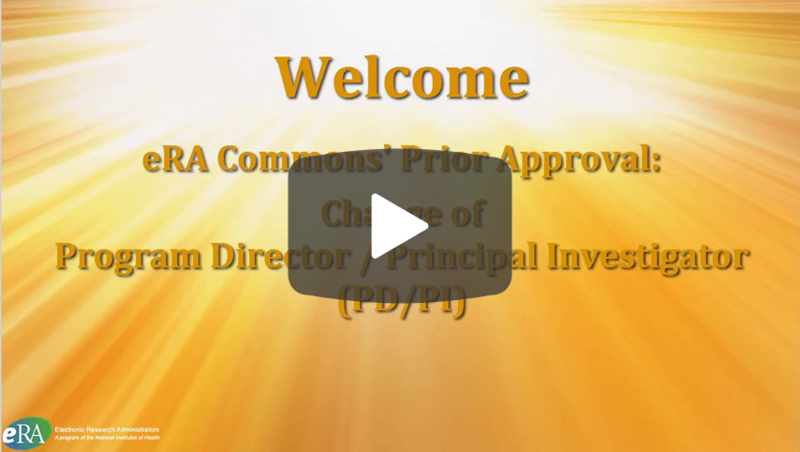 This tutorial demonstrates the steps a Signing Official (SO) takes to electronically submit a Change of PD/PI Request for a grant through eRA Commons’ Prior Approval Module. 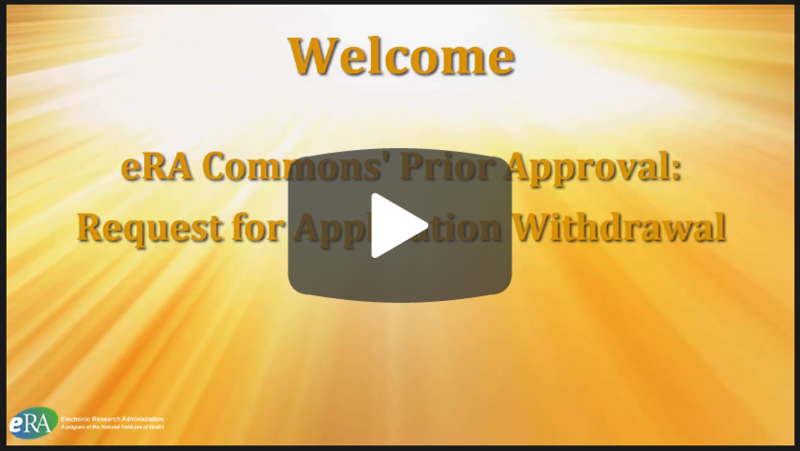 This tutorial will demonstrate how and when Signing Officials (SOs) can electronically submit a No Cost Extension (NCE) request for a grant through eRA Commons’ Prior Approval Module. A No Cost Extension is a request to extend the time of a project period and/or budget period to complete the work of the grant under that period, without seeking additional Federal funds. 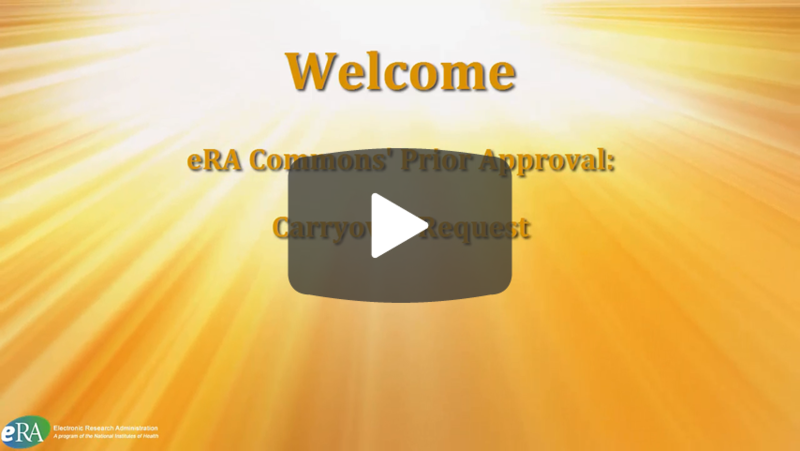 This tutorial will demonstrate how to submit a Carryover request for a grant through eRA Commons’ Prior Approval Module. A Carryover request is a request to carry forward funds from the end of one budget period to a future budget period. 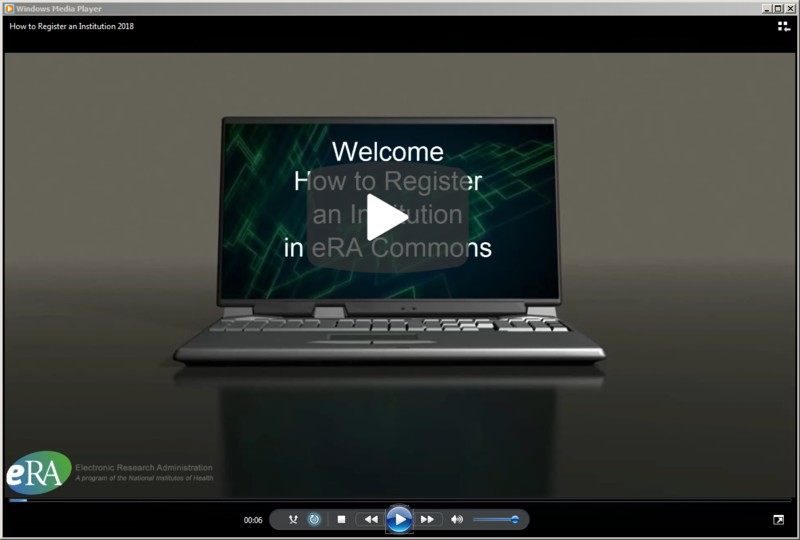 This tutorial demonstrates the process that must be followed to register an institution or organization in eRA Commons. Signing Officials (SO) and Account Administrators (AA) are responsible for creating and maintain accounts in eRA Commons. This video reviews the steps required to create and account for others. Trainees are typically invited to eRA Commons by their Principal Investigators (PI). This tutorial reviews the steps a PI takes to initiate that invitation. This video does not apply to trainees using the CareerTrac system. A trainee account can also be created like any other account by a Signing Official or Account Administrator. See How Signing Officials Create Accounts in eRA Commons for steps on this process. This tutorial focuses on how NIH Scholars get themselves registered in eRA Commons. This tutorial goes through the steps on how to get to the Status search options if you are Signing Official or a Principal Investigator; it outlines the importance of the Status screen; it highlights some of the critical actions that must be taken to manage a grant application from submission to award to closeout. Focused on the tools available to a Signing Official, who might manage hundreds of grants, if not more. The video reviews the three ways an SO can search for a grant application, and the various other search filters available to them in the Status module. Covers the information available on the Status Result screens. The video highlights how Status module search results are displayed and organized and the importance of checking the items listed in the Action column. Depending on the user's role (SO or PD/PI) and the type of search, the search results might vary a little. The Status Search screen for Principal Investigators (PIs) has been redesigned. The new design is cleaner, easier to read, utilizes responsive design (self-scaling for screen size), and organizes search results in “families” based on the Application ID number. This short video demonstrates this new design and highlights the new functionality of the search results. Video 5 of this series looks at the Detailed Status Information screen. The Detailed Status Information screen is the culmination of the latest information about your grant application, including critiques, scores, NIH contact information, award information, and more. Video 6 of the Status series looks at the steps a Principal Investigator (PI) takes to access the Summary Statement. Additionally, the video summarizes, at a high level, the review process for grant applications. It is this review process that generates an evaluative document called the Summary Statement. Because the Summary Statement is considered and evaluation, it is only available to PIs. Video 7 of the Status series examines how to access the Notice of Award (NoA) document when a grant application has received funding. The NoA spells out all the details of the award, including amount of funding, and all the terms and conditions of the award. Video 8 of the Status Series looks at how to access and submit Just in Time (JIT) information. Frequently after an application has gone through the peer review process and before a funding decision is made, the assigned Institute or Center (IC) will request additional information such as IACUC, IRB, and/or Human Subject Assurances. Just in Time is the process of providing that information to NIH. Video 9 of the Status series focuses on how a Signing Official can access and submit a No Cost Extension request. NIH allows grantees to extend the final budget period of a grant by as much as 12 months, as long as they are not asking for additional NIH funds. This video shows how to access the link for a No Cost Extension and submit the request for an extension. Video 10 of the Status series demonstrates how a Signing Official can access and submit a Relinquishing Statement (RS) as part of the Change of Institution process. The Change of Institution process allows the grantee institution to give up, or surrender, a grant to another institution, who will take over the approved research project. The Signing Official submits a Relinquishing Statement (RS) to Grants Management which initiates the Change of Institution request. The xTRACT module allows applicants, grantees and assistants to create research training tables for progress reports and institutional training grant applications. This short video provides a high level overview of the functionality of xTRACT and the benefits is provides to you. This is the second in a series of video tutorials for xTRACT. xTRACT is used by Signing Officials, Principal Investigators, and Assistants to create training tables for application submission as well as for Research Performance Progress Reports (RPPR). This video tutorial demonstrates how to use xTRACT to prepare a training table, known as a Research Training Dataset (RTD) for an RPPR. Welcome to this third tutorial on xTRACT. This video focuses on Preparing a Research Training Dataset, or RTD, for a New Application using xTRACT. One of the goals of xTRACT is to provide applicants with a convenient means of creating training data tables for applications. This tutorial highlights those steps. This short video provides an overview of the Internet Assisted Review (IAR) module. It highlights how to access IAR, steps reviewers need to take before reviewing grant applications and additional resources for reviewers. For Reviewers: You Received an IAR Invitation. Now What? This tutorial will guide reviewers on how to get started on IAR upon receiving the scientific review invitation emails from SROs. Tutorial to walk reviewers through the process of entering information in the Secure Payee Registration System (SPRS) to get paid the honoraria and expenses for their review-related service. This tutorial demonstrates how reviews sign the Confidentiality Statement in IAR and indicate their status as a federally registered lobbyist. This tutorial will guide Reviewers on how to set up and maintain their own Personal Profile information in eRA Commons. This tutorial walks reviewers through the process of accessing grant applications in IAR and meeting materials provided by a Scientific Review Officer (SRO) for a review meeting. This tutorial will provide reviewers an overview of the differences between participating in a virtual scientific review meeting in IAR, the Internet Assisted Review module, and a traditional face-to-face meeting. This tutorial will walk reviewers through the process of entering initial comments on an application being reviewed while participating in a virtual meeting in IAR. This tutorial will walk reviewers through the steps on how to rescue applications for discussion that are designated in the lower half of a Virtual Meeting in IAR, Internet Assisted Review. This tutorial will walk through what happens during the Discussion phase on the Virtual Meeting Discussion Dashboard, the central hub of activity during a virtual meeting. This tutorial will help you get familiar with the use of left navigation box on the Virtual Meeting Discussion Dashboard screen in IAR, the Internet Assisted Review module. The blue navigation box plays an important role during the online meeting discussion. This tutorial will guide you through the Scoring Process for a Virtual Meeting in IAR, the Internet Assisted Review module. NIH is launching a new electronic system to manage human subjects and clinical trials information. This Human Subjects System replaces the Inclusion Management System (IMS) and will be used by grant applicants, recipients and NIH staff. This short video provides an overview of its functions and features. This Human Subjects System (HSS) tutorial reviews the steps to export study record data to facilitate the registration of the study at ClinicalTrials.gov. One of the requirements of award recipients when conducting clinical trials, is to register their study at ClinicalTrials.gov within 21 days of enrolling their first patient. To reduce this burden on award recipients, this feature permits users to export study record entries that correspond to fields in ClinicalTrials.gov as an XML file. The exported XML file can then be uploaded to ClinicalTrials.gov. Welcome to this video tutorial on How to Access the Human Subjects System in eRA Commons. A principal investigator or signing official may need to edit an existing human subjects study record. This tutorial demonstrates the steps to access and edit a human subjects study record.